I signed up for Wilton cake decorating classes a few weeks ago at my local Michaels. 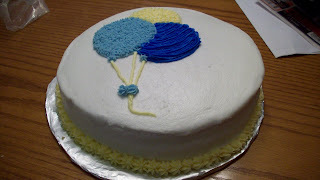 I thought it might be fun to learn some decorating tricks and tips rather than just always slathering on icing with a knife. This week was the second class in Course 1, so I actually baked a cake, frosted it and took it in to class with me to decorate. I had to make 4 different colors of icing this week in 3 different consistencies (although we didnt even use 2 colors but oh well). The first class you just sit and watch the instructor. She showed us how to prepare the icing in different consistencies and some basic piping bag techniques and skills. We learned some pretty basic decorating stuff this week, star tip patterns and zig zags, dots, and pattern transfer. Practiced writing a little bit and that was about the extent of it. The first course isn't too challenging but its nice to learn the basic tips and techniques properly from someone who has been doing it for years. So far I have invested about $60, $25 for the class plus supplies. I bought more than I needed to because I plan to take Course 2 as well, so I bought a 50 piece decorating kit that had more tips in it, a tackle box to carry all my supplies in, a turn table, lots of piping bags, gel coloring, piping gel, meringue powder... Luckily I always have a Michael's coupon so I was able to get most everything at 40% off. Preheat oven to 350 degrees and butter and flour 2 9" pans or 3 8" pans (I think in the future I will just use 2 8" pans - 3 resulted in 3 very thin cakes). In a mixing bowl, cream butter until smooth and gradually add the sugar. Beat until light, 3-4 minutes. Beat in the eggs, one at a time, then the extracts. Combine the flour, baking powder, and salt and add to the egg mixture by hand in parts, alternating with the milk. Stir just until smooth. Pour the batter into the prepared pans (to get your cakes to be the same thickness, divide batter evenly by putting in 1/2 cup cake batter into each pan, alternating until you've used all the batter). Bake for about 25 minutes, until toothpick inserted in the center comes out clean, rotating the pans in the oven so each cooks the same amount of time in each position (this will help keep them level). 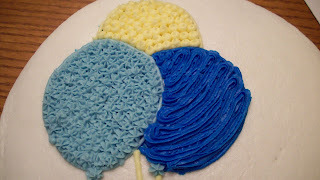 @Sabby - I used the Wilton buttercream recipe for this since I was making it for class. 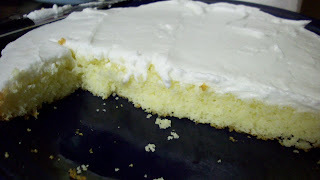 It's not my favorite recipe by any means but you can find it on the Wilton website. 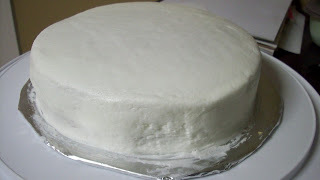 I would recommend a regular buttercream made with real butter instead of shortening and milk or cream instead of water.